What’s in store for the next Florida legislative session? 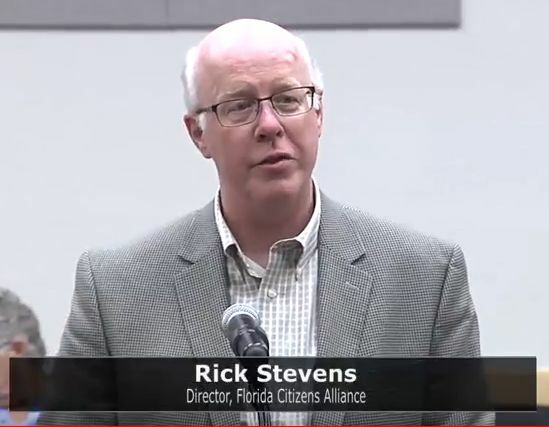 The creationist, human-caused-climate-change-denying group Florida Citizens Alliance was successful in writing and getting passed a new law that dramatically impacts how instructional materials used in our schools can be challenged and changed — in a bad way. (See the Instructional Materials bills ’17 blog category if you don’t know what I’m talking about.) And they are already hard at work crafting new bills for the next legislative session that could spell more doom for public education. Go to this Youtube video that shows the Lee County Legislative Delegation Oct. 18 meeting. Skip to about 5:47:45 when Pastor Rick Stevens of the Alliance speaks. He revealed that the Alliance is working on two bills and possibly a third. One bill will require that textbooks approved at the state department of education level adhere to Florida law. I believe, but I’m not positive, that he means that all instructional materials reviewed and approved at the state level should follow part of Florida law that says such materials, among other things, be “balanced” and “noninflammatory.” They had squeezed that bit into their successful new instructional materials law that applies to the local school board level. If that is their intent with this new bill on the state level, what do you think their ultimate goal is? Creationism alongside evolution? Climate change denial in climate change lessons? That bill will also require some type of guarantee from textbook companies that they’ll “correct” or refund or something if the materials don’t adhere to law or something. Sorry to be vague here, but Stevens’ quick description is vague. The other bill being worked on will encourage school boards to not just merely “meet” the requirements of the state education standards, but to “exceed” them where possible. Once again, you have to wonder if they mean for school boards to “exceed” science standards by including creationism or climate change denial. I admit I could be wrong in my guesses. But probably not. Stay tuned. 2 Responses to What’s in store for the next Florida legislative session? The basic law is the State Standards. The various other terms will turn out to be too vague for law. I wonder if this will make it’s way into textbooks?